36 HOURS AGO: A brutal serial killer is arrested on the streets of north London after a two-year reign of terror. Known as the Night Creeper, he's earned his reputation by torturing five young women to death. 24 HOURS AGO: Undercover cop Sean Egan has infiltrated one of the country's most notorious criminal gangs. Now he's about to risk his life in a desperate bid to bring its members to justice. 12 HOURS AGO: DI Tina Boyd has discovered that the Night Creeper's murders are part of a much larger criminal conspiracy. But her quest for the truth has brought her into contact with some very dangerous people who want to silence her - permanently. 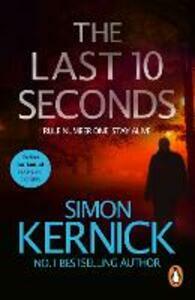 THE LAST 10 SECONDS: A man, a woman, a sadistic killer. As they race towards a terrifying confrontation only one thing is certain: they're all going to have to fight very hard just to stay alive.